Not by Love Alone: The Violin in Japan, 1850-2010. Copenhagen: The Sound Book Press, 2014. Suzuki Shin’ichi, the Tokyo String Quartet, Midori – How did Japanese violinists manage to revolutionize violin teaching, win international competitions, conquer Western concert stages and take up positions in leading orchestras and prestigious music faculties? What enabled the Japanese to master Western classical music within a few decades? What are the true origins of the Suzuki Method? What has the triumph of Western classical music meant for the traditional music of Japan? Not by Love Alone presents Japan’s biggest success story: the complete assimilation of an alien musical tradition within a few decades and Japan’s rise to a musical superpower in the latter half of the twentieth century. The violin played a key role in this story. Mass-produced by Suzuki Masakichi already in 1900, it became the vehicle for Suzuki Shin’ichi’s pioneering method fifty years later. 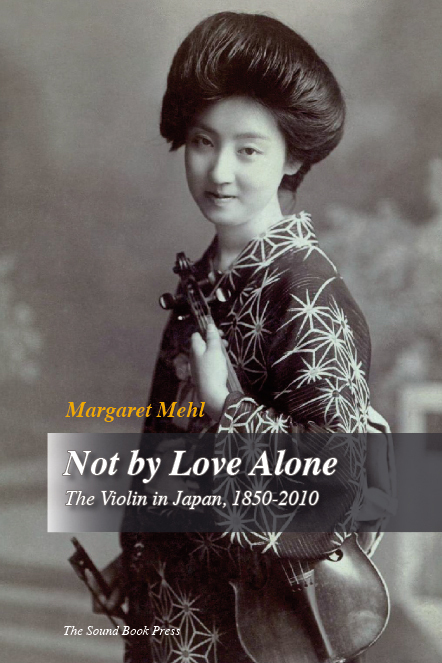 Not by Love Alone traces the history of the violin in Japan from its beginnings to the present day. It presents the most important pioneers, both Japanese and foreign, the first students, violin makers and composers for the violin, early child prodigies, pioneering teachers, and today’s leading violinists, including those who have crossed stylistic boundaries. In addition Not by Love Alone discusses the relationship between the violin and the traditional music of Japan as well as the violin’s part in expressing Japan’s modern identity in the age of globalization. Not by Love Alone is available from Amazon and other major retailers. In addition to Kindle, you can also purchase e-books from Kobo. Not by Love Alone has been reviewed by David Schoenbaum at www.violinist.com. P.S. Not by Love Alone has been removed from Google Play because of what many publishers and authors perceive as the company’s cavalier attitude to piracy see comment on my Facebook author page (12 October 2015).